254 pages | 5 B/W Illus. In this book, economists and literary scholars examine the uses to which the Robinson Crusoe figure has been put by the economics discipline since the publication of Defoe’s novel in 1719. The authors’ critical readings of two centuries of texts that have made use of Robinson Crusoe undermine the pervasive belief of mainstream economics that Robinson Crusoe is a benign representative of economic agency, and that he, like other economic agents, can be understood independently of historical and cultural specificity. The book provides a detailed account of the appearance of Robinson Crusoe in the economics literature and in a plethora of modern economics texts, in which, for example, we find Crusoe is portrayed as a schizophrenic consumer/producer trying to maximize his personal well-being. 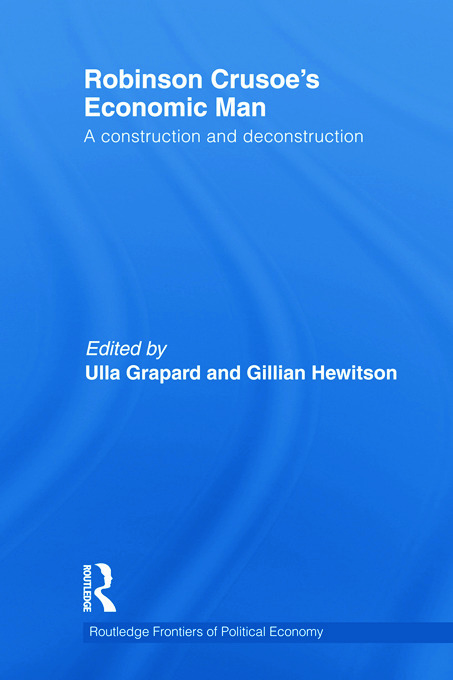 Using poststructuralist, feminist, postcolonial, Marxist and literary criticism approaches, the authors of the fourteen chapters in this volume examine and critique some of the deepest, fundamental assumptions neoclassical economics hold about human nature; the political economy of colonization; international trade; and the pervasive gendered organization of social relations. The contributors to this volume can be seen as engaging in the emerging conversation between economists and literary scholars known as the New Economic Criticism. They offer unique perspectives on how the economy and economic thought can be read through different disciplinary lenses. Economists pay attention to rhetoric and metaphor deployed in economics, and literary scholars have found new areas to explore and understand by focusing on economic concepts and vocabulary encountered in literary texts. Ulla Grapard is Associate Professor at Colgate University, USA, where she teaches economics and women’s studies. A founding member of IAFFE, the International Association For Feminist Economics, her research concerns feminist critiques of economic theory and practice from a postmodern perspective. Gillian Hewitson is a Lecturer in the Department of Political Economy at the University of Sydney, Australia, where she teaches in feminist economics, heterodox economics and the political economy of development. Her research is located at the intersection of feminist economics, postcolonialism and economics and the history of economic thought.